When reflecting on the life of Brent Rouget, it is easy to see that his family was his greatest source of pride and joy. He was a devoted father who worked hard to provide his family with an amazing life. Brent was the sort of person who could be counted on to be there when needed, and although he accomplished so much of which to be proud he was humble man who was filled with a quiet strength. He was a longtime resident of the community he loved, and in many ways he was a kid at heart. Dearly loved, Brent will be forever missed. Life in America during the 1960s was very eventful. Civil rights and women’s rights often topped the headlines of the day, and this was also when we elected the young John F. Kennedy as our 35th President of the United States. There was great cause for celebration as the decade came to an end when we put the first man on the moon. 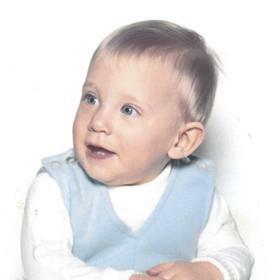 Amidst this exciting time was a time of great joy in the lives of Harold and Angie (LaSotta) Rouget as they announced the birth of the baby boy they named Brent H. on May 15, 1968, in Coldwater, Michigan. Raised in Auburn, near Bay City, he was the younger of two as he was raised in the family home alongside his sister, Kimberly, who was two years older. While in high school he earned 4 varsity letters in wrestling. Brent’s father took him hunting and fishing, and this was all it took for Brent to develop a lifelong love for fishing. He enjoyed riding his 4-wheeler and many times rode to places he didn’t want his parents to know about. Brent attended local schools and was a talented baseball player who could cover multiple positions. He continued to play throughout high school receiving a varsity letter all 4 years, and as a student at Western High School in Auburn he also excelled in his studies.  After graduating from high school in 1986, Brent was eager for all that life had in store. He attended Michigan State University where he was a member of a fraternity. His father and sister had also attended MSU. For the rest of his life Brent was a passionate fan of the Spartans. After earning his BS in Package Engineering, he moved to Chicago where he worked at Redexx Packaging and later for Sara Lee. For more than 19 years, Brent worked for Kellogg’s. There, he held a variety of positions after starting out in package engineering. Brent then moved into procurement, and he had most recently been working as a senior manager for snack operations business resources. He was very good at what he did, and he enjoyed the people he worked with. Brent certainly made it more fun at work as he was known to pull pranks on his co-workers such as the time he lined a co-worker’s desk drawer in plastic and then filled it with water and added goldfish. He also covered someone’s entire car in packaging tape! Everyone knew not to do anything to Brent as it would always come back 10 fold! Also while he was busy getting established in his work, Brent was introduced to the young woman who would change the course of his life forever. Her name was Annmarie Weber, and they met in a blues bar with a big group. Although they were set up to meet, they were naturally drawn to one another. Annmarie couldn’t help but notice his Timberland shoes, and since it was so loud and busy in there it was the only thing she could remember about him until they later connected outside. Brent asked his friend for her phone number, and Annmarie’s friends told her he was a nice guy and she was going to go out with him. They began dating, and since Brent was known for taking his time and doing things on his own terms, they dated for a full five years. 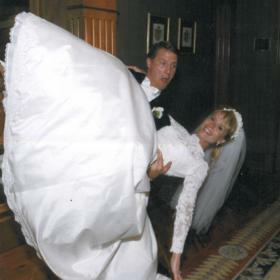 Finally, they were married on October 30, 1999, at St. Hubert’s Church in Hoffman Estates, Illinois and then enjoyed a honeymoon in Marco Island, Florida. 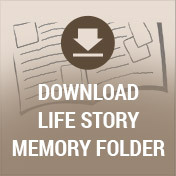 Since he had just started working for Kellogg’s in Kalamazoo, Michigan, the newlyweds settled there. They later moved to the place they have called home for the past six years. There was never anything that was of greater importance to Brent than his family. He and his wife welcomed two children, Brendan who was born in 2001 and Caroline who was born in 2003, into their hearts and home. 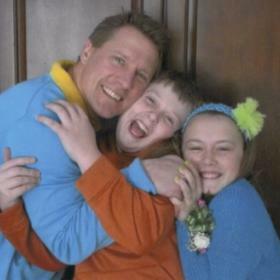 Brent was an active part of his children’s lives. He was very handy and built a swing set in the yard, and he always made sure they were dressed in their MSU gear. He hated missing a game, so he once let his daughter put red lipstick all over his face just so she was entertained and he could watch the MSU football game. When his kids were playing baseball and softball, he was always involved somehow and even coached sometimes. Brent drove them to school once a week or so while they attended St. Augustine School, and in the car they usually played the quiet game. It has been said that he always drove fast, too. 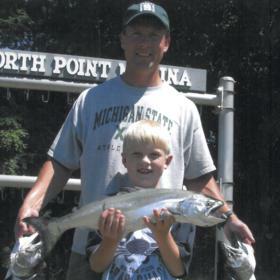 As a family they enjoyed renting a small cabin on Long Lake in Traverse City, and for years Brent took his kids fishing. Holidays were special because they had several traditions like eating crab legs on Valentine’s Day. Halloween found them having pumpkin carving parties, and on the last day of school they usually had a party. For Christmas they always went and cut down a live tree. Actually, Annmarie usually organized these things while he was always a trooper and went along. If Brent was in town, he never missed any of his kids’ events or activities. He loved father/daughter dances, making pinewood derby cars with his son and attending all of their sporting events. Throughout his life Brent was a man of many interests. He maintained an active lifestyle and was very athletic. He grew up on boats and skied including barefoot, and when his kids were young he did some adventure races. Brent had currently been running and working out everyday at Kellogg’s, Bronson Fitness, or just taking a run outside. He also made sure he drank enough water. As a handy person, Brent finished the entire basement in their first house including all the framing, electrical, plumbing, and finishing work. Annmarie was a great cook, and he liked trying different foods. He was into Green Day music, and he was a homebody who didn’t really enjoy crowds and was mostly content just to be at home with his family. All who knew Brent Rouget would agree that he was one of the nicest people around. He had a dry sense of humor, loved playing jokes on family and friends, and could dish it out with the best of them. Brent never missed a day of work, and he was an amazing provider for his family. His zest for life was contagious, and he was the heartbeat of wherever he went. Brent will never be forgotten. 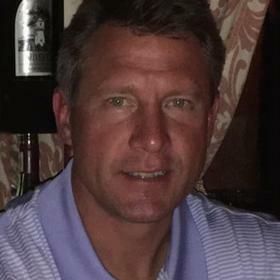 Brent H. Rouget, of Kalamazoo, died unexpectedly on October 25, 2018 in Kalamazoo. Surviving are his wife of 19 years, Annmarie (Weber) Rouget; 2 children: Brendan and Caroline; parents Harold and Angie Rouget; sister, Kimberly (Pete) Pendergast; nephew and niece, Jacob and Lauren, many aunts, uncles and cousins and “Lucy”. Visit with family and friends while sharing food and refreshments on Thursday from 5-8 p.m. at Betzler Life Story Funeral Home, 6080 Stadium Dr. Kalamazoo (269) 375-2900. Mass of Christian Burial will be celebrated Friday 10 a.m. at St. Augustine Cathedral. Burial will follow at Hope Cemetery. Please visit Brent’s personal web page at www.BetzlerFuneralHome.com, where you can archive a favorite memory or photo and sign his online guestbook before coming to the funeral home. Memorial contributions may be made for his children’s education to: Brendan and Caroline Rouget Education Fund.